Adjuvant treatment in gastric adenocarcinoma has been a challenge for the treating specialists, and despite several trials, a clear consensus is yet to be defined. The higher propensity for lymph nodal involvement and locoregional recurrences led to the hypothesis that locoregional and systemic treatments need to be equally aggressive to achieve better outcomes in the management of gastric adenocarcinoma. Regional, ethnic, and biological differences between the Eastern and Western population are also found to reflect in the tumor behavior and its response to treatment. The MAGIC (Medical Research Council Adjuvant Gastric Infusional Chemotherapy), Intergroup 0116, ACTS-GC (Adjuvant Chemotherapy Trial of S-1 for Gastric Cancer), CLASSIC (Capecitabine and Oxaliplatin Adjuvant Study in Stomach Cancer), ARTIST (Adjuvant Chemoradiation Therapy in Stomach Cancer), and the recently published CRITICS (Chemoradiotherapy after Induction Chemotherapy in Cancer of the Stomach) trials were a few of the randomized controlled trials that tried to give a clearer perspective of this tumor, though it still remains a dilemma. A study incorporating the tumor and demographic factors along with the availability of skilled talent and resources might generate an answer. Gastric cancer is one of the leading causes of death, especially in the East Asian countries, and it continues to be a challenge for the specialists and givers care even after several randomized controlled trials. Survival for gastric cancer was dismal in the earlier years. Locoregional recurrences reported earlier were up to 82%. Hallisey in 1994 reported 5-year survival of 20% for surgery alone, 12% for surgery followed by radiotherapy, and 19% for surgery with chemotherapy and concluded surgery to be the treatment of choice. The National Cancer Data Base review, in 2000, reported a 10-year survival rate of 65% for patients with Stage IA and a rate of 3% to 42% for more advanced disease, which clearly showed an improvement over the earlier reports. Curative surgery was known to fail locally with anastomotic and regional nodal recurrences of up to 40% to 65%, which intensified the quest for adjuvant support. The extent of surgery, need for chemotherapy, and usefulness of adjuvant radiation were all criticized by various groups, and consensus is yet to be arrived at, despite definitive improvement in the outcome observed in various trials. This review attempts to give a concise overview of the existing literature. National Comprehensive Cancer Network, the American guidelines, recommend surgery for all resectable non-metastatic gastric cancers. Surgery as a standard of care was suggested by the Canadian and the Japanese guidelines,, and on the basis of tumor location, it is either total or partial gastrectomy. Extensive procedures such as extended mucosal resection and extended submucosal dissection are considered, for lesions confined to the mucosa with no ulceration, by the Eastern countries such as Japan and Korea. Gastric tumors show a high incidence of lymph nodal involvement. T1 tumors limited to the mucosa have shown 10% incidence of lymph nodal involvement, whereas T1 tumors with submucosal extension show 20% incidence. T2 tumors, where muscle invasion is seen, have 50% incidence, and T3 tumors, which specifies serosal invasion, have 70% nodal involvement. Despite this high propensity for lymph nodal involvement, distant metastasis is often delayed. Locoregional failure is known to significantly affect the overall survival (OS). This biological behavior wherein the disease is locoregionally contained has led to the idea of extensive nodal dissection to achieve better locoregional control. The terms D1/D2/D3 nodal dissections were originally coined by the Japanese classification of gastric carcinoma. The present classification of nodal dissections is D1, D2, D3, and D4. D1 dissection denotes removal of nodal stations 1 to 6 that constitute the N1 nodes, namely: nodes along right (level 1) and left cardia (level 2); lesser (level 3) and greater (level 4) curvature; short gastric vessels (level 4sa);along left (level 4sb) and right (level 4d) gastroepiploic vessels; suprapyloric nodes (level 5); and infrapyloric nodes (level 6). Incomplete N1 dissection is categorized as D0 dissection. D2 dissection involves resection of N2 nodes namely: nodes along left gastric artery (level 7); common hepatic artery (level 8); celiac trunk (level 9); splenic hilus (level 10); and splenic artery (level 11). 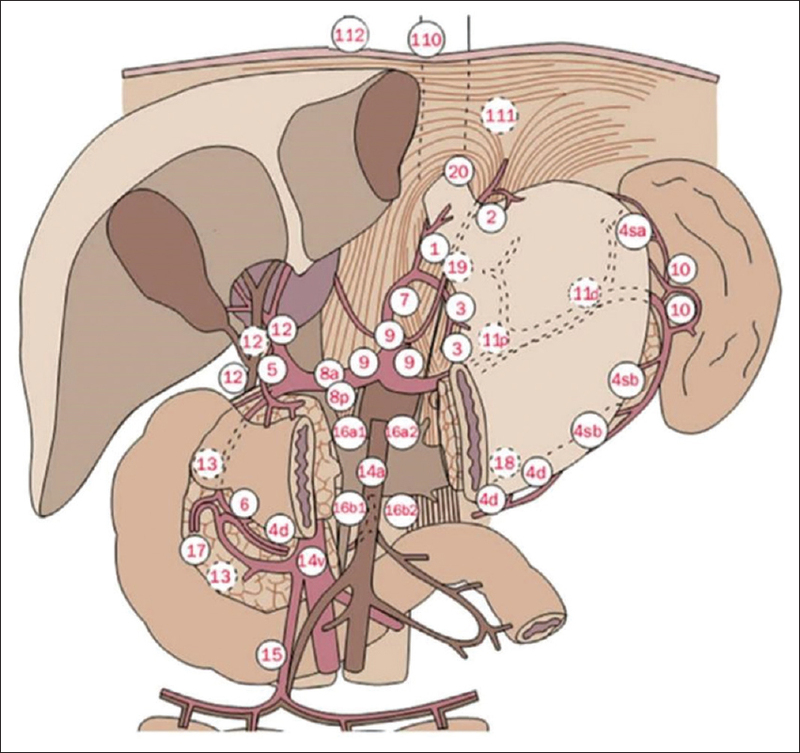 D3 dissection removes the N3 level, which includes, nodes in the hepatoduodenal ligament (level 12); nodes on the posterior surface of head of pancreas (level 13); nodes at the root of mesentery (level 14); nodes along superior mesenteric artery (level 14 A); and superior mesenteric vein (level 14V). A D4 dissection removes the N4 nodes, namely: para-aortic (level 15) and para-colic (level 16) nodal stations [Figure 1], [Table 1], and [Table 2]. Outside Japan, the classification of D1 and D2 are not strictly followed. D1 is considered as perigastric nodes and D2 as nodes along the celiac axis. However, the Japanese definition is more complex, and the same nodal station can be classified as nodal group 1, 2, or 3 depending on the location of the primary tumor. The Cochrane database meta-analysis of the trials that compared D1 and D2 dissection showed an increased risk of mortality with D2 dissection because of the resection of spleen and pancreas. Randomized trials failed to show any survival advantage for D2 dissection, except for the subgroup of tumors, which were T3 and above. Confounding factors in these were low case volumes, surgical learning curves, and poor surgeons' compliance. Non-randomized trials showed a significant advantage for extensive nodal dissection. The major studies that looked into D1 versus D2 dissection were the MRC ST01(Medical Research Council (MRC) gastric cancer Surgical Trial (ST01)-1986) trial and the Dutch study. Interestingly, the MRC ST01 reported better survival for those who had undergone D2 dissection without pancreatic and splenic resection. Modified D2 dissection was found to result in significant survival advantage in T3NxM0 patients. A retrospective article from Japan, which compared laparoscopic and open D2 dissection, has suggested better long-term oncological outcome with laparoscopic dissection in advanced gastric cancer. The concept of a D1+ surgery was opted in the Chemoradiotherapy after Induction Chemotherapy in Cancer of the Stomach (CRITICS) study, where resection of level 1 to 9 and 11, without splenectomy and pancreatectomy was considered. This procedure was well tolerated with more than 87% undergoing a D1+ dissection and a median lymph nodal harvest of 20. Chemotherapy has been used for adjuvant care of gastric cancer since the 1960s. Single-agent chemotherapy was used in the early seventies achieving 20% response rate, using drugs such as 5-flurouracil (5-FU), mitomycin-C, BCNU, and doxorubicin. Subsequently, cisplatin and etoposide were also found to improve survival. The combination of these drugs was later tried. The meta-analysis of the chemotherapy trials showed a relatively significant advantage for combination chemotherapy as opposed to a single agent chemotherapy. Best survival advantages were observed for three drug regimens with 5-FU, anthracyclin, and cisplatin combinations, in this meta-analysis. The two practice changing, landmark trials often quoted in relation to adenocarcinoma of the stomach are the Medical Research Council Adjuvant Gastric Infusional Chemotherapy (MAGIC) and the South West Oncology Group (SWOG) – Intergroup study 9008/INT-0116 trials; the two randomized controlled trials conducted at the turn of the century. The intergroup trial documented improved OS and relapse-free survival after surgery when adjuvant locoregional radiotherapy with concurrent chemotherapy using fluorinated pyrimidine was added. The median survival was 36 months with the addition of adjuvant chemoradiotherapy, in comparison to 27 months with only surgery. However, the MAGIC trial came out with the conclusion that perioperative chemotherapy using epirubicin, cisplatin, and 5FU (ECF) regimen significantly improved OS and progression-free survival (PFS) over those who had only surgery. Five-year survival rates for the perioperative chemotherapy group was 36.3%, whereas surgery alone arm had only 23%, with a convincing advantage of 13%. The intergroup trial published in 2001 was much criticized on account of non-uniform nodal dissection. Only 10% of the recruited patients had D2 dissection, whereas 54% had D0 dissection. The toxicity rates were also high in the trial arm. Only 64% of patients in the chemoradiotherapy arm had completed the planned course of treatment. The Dutch gastric cancer group study had earlier looked at preoperative chemotherapy using four cycles of FAMTX, (5-FU, adriamycin, and methotrexate), but the study was closed before completion because of a poor percentage of radical resection in the chemotherapy arm., It had concluded that more aggressive treatment was needed for better tumor control. In MAGIC, the peri-chemotherapy trial of 2006, 84% of patients had completed the planned three courses of neoadjuvant ECF regime, whereas only 49.5% had completed post-surgery chemotherapy courses. Acute toxicity profile, death within 30 days of surgery and the median hospital stay were similar in both the arms. A meta-analysis of 12 trials that looked at OS showed significantly reduced overall mortality with the addition of radiotherapy alone (Hazard Ratio of 0.78), when compared with chemoradiotherapy. They also observed improved disease-free survival (DFS) with the use of radiotherapy. Several other meta-analyses have also looked into the advantages of radiotherapy and quoted benefits for adjuvant radiotherapy with improved OS. However, the meta-analysis of chemotherapy trials came out with a significant advantage for chemotherapy as an adjuvant. The Japanese trial, an Adjuvant Chemotherapy Trial of S-1 for Gastric Cancer (ACTS-GC), a phase III randomized study had compared D2 dissection alone versus D2 dissection with adjuvant chemotherapy using S-1 (a dihydro-pyrimidine-dehydrogenase inhibitory fluoro-pyrimidine preparation that combined tegafur, gimeracil, and oteracil potassium). The 5-year OS was 71.7% in the S-1 arm and 61.1% in the surgery alone arm. The trial had concluded that adjuvant chemotherapy for 1 year, post-surgery, significantly improved the survival. Addition of S-1 reduced the risk of relapse by 34.7% and risk of death by 33.1%. Interestingly, their 5-year OS for the surgery alone arm was an impressive 61.1%, a very high rate compared to western publications. The Capecitabine and Oxaliplatin Adjuvant Study in Stomach Cancer (CLASSIC), a phase III open-labeled, multicenter, randomized study conducted in Korea, China, and Taiwan, had a follow-up of 34 months and showed DFS of 74% and OS of 83% in the chemotherapy and surgery arm, compared to 59% and 78% in the surgery alone arm. Following the MAGIC trial that had shown a trend toward better tolerance of preoperative chemotherapy, a few trials were planned in this direction. A phase III trial was conducted by the Federation Nationale des Centres de Lutte contre le cancer (FNCLCC) and the Federation Francophone de Cancerlogie Digestive (FFCD), the French group. The FNCLCC/FFCD-9703/ACCORD-07 (Action Concertees dansles cancer Colorectaux et Digestifs) trial, published in 2011, compared preoperative chemotherapy using 5-FU and cisplatin versus surgery alone. The trial was closed prematurely because of poor accrual, and the subset analysis of gastric cancer patients showed a 5-year OS of 38% versus 24% in the control arm. Although this was similar to that quoted by MAGIC, MAGIC had used ECF continuous infusion. The EORTC 40954, which looked at preoperative chemotherapy using cisplatin, 5-FU and leucovorin, was also stopped because of poor accrual. The percentage of R0 resection in the neoadjuvant group (81.9%) was better than the primary surgery arm, (66.7%). All these trials stressed the advantage of neoadjuvant chemotherapy over primary surgery. The Adjuvant Chemoradiation Therapy in Stomach Cancer (ARTIST) a randomized phase III trial, conducted in Korea, looked at adjuvant chemoradiation in the postoperative setting. Gastric cancer patients after D2 dissection were randomized to adjuvant chemoradiation and chemotherapy. The 3-year DFS was similar in both groups, except for the node-positive subgroup, who showed a definite advantage, with chemoradiation. Yu and colleagues came out with the observation that adjuvant radiation reduced locoregional recurrence in group 3 lymph nodes. The ARTIST trial, thus, came out with the hypothesis that there is a subgroup of patients who would benefit from aggressive locoregional chemoradiotherapy. The study also had suggested that patients with Lauren classification – intestinal type histology would benefit with adjuvant chemoradiation. The ongoing ARTIST II trial is looking into this hypothesis and might be able to define the role of postoperative concurrent chemoradiation in patients with stage II and III disease with positive lymph nodes, treated with D2 lymphadenectomy. A similar ongoing trial in China is also exploring the benefits of adjuvant radiation, and both the trials are still enrolling patients. The Dutch CRITICS study looked at induction chemotherapy followed by surgery and subsequent adjuvant chemotherapy versus chemoradiotherapy., The results of the CRITICS study were presented at the ASCO 2016. The median OS was 3.5 years in the chemotherapy arm and 3.3 years in the chemoradiotherapy arm, and the median PFS 2.3 and 2.5 years. The study had concluded that the results were similar in both the arms. The proponents of the trial had acknowledged that only 50% of the patients accrued had completed the planned course of treatment. The recent update on this has come out with the observation that, at a median follow-up of 61.4 months, the median OS was 43 months in the chemotherapy arm and 37 months in the chemoradiotherapy arm and has concluded that postoperative chemoradiotherapy did not improve OS when compared with postoperative chemotherapy. A subset analysis of the node-positive patients might show a better understanding of the treatment outcomes. The preoperative chemoradiotherapy was tried in gastroesophageal junction adenocarcinoma in the preoperative chemotherapy or radiochemotherapy in esophagogastric adenocarcinoma trial study. The patients were randomized to preoperative induction chemotherapy using PLF regime (Platinum, Leucovorin, and 5-FU) alone and preoperative induction chemotherapy using PLF followed by pre-operative radiotherapy to a dose of 30 Gy in 15 fractions with concurrent chemotherapy using cisplatin and etoposide.,,,, The study was stopped prematurely because of poor accrual. The median OS was 33.1 months for chemoradiotherapy arm, whereas chemotherapy only arm had 21.1 months (p-0.07), which failed to show statistical significance. The dose of radiation was much less than the present accepted standards, and although not significant, the mortality rate was higher in the chemoradiotherapy arm (10.2% versus 3.8% - p-0.26). The Chemotherapy for oesophageal Cancer Followed by Surgery Study trial also looked at preoperative chemoradiation for tumors of oesophageal and esophagogastric junction, which compared preoperative concurrent chemoradiotherapy with weekly carboplatin and paclitaxel and a radiation dose of 41.4 Gy in 23 fractions followed by surgery on one arm, with only surgery on the other. A R0 resection was achieved in 92% in the chemoradiotherapy arm, whereas the surgery alone arm had 69% (P < 0.001), with 29% complete pathological response in the chemoradiotherapy arm. Adenocarcinoma had 23% complete pathological response and squamous cell carcinoma 49%. Intent to treat analysis had shown median OS of 49.4 months for the chemoradiotherapy arm and 24 months for the surgery arm. Interestingly, despite different pathological response according to histology, it did not show any prognostic significance on survival. [Table 3]: Important phase III trials in gastric adenocarcinoma]. The meta-analysis of the radiotherapy trials by Ohri et al. did not demonstrate any difference with the timing of the radiotherapy. Four trials of preoperative radiotherapy were included in the meta-analysis, and they showed a survival advantage with a HR of 0.79. The postoperative radiotherapy also showed a significant advantage for the addition of radiotherapy. They had concluded that the addition of radiotherapy provided 20% improvement on both DFS and OS, and there was no subgroup who failed to show a benefit. Another recent observation from Korea gives an inferior 5-year OS with CRT (Chemo-Radiotherapy), though the 5-year DSS was comparable, (no RT - 71.4%, RT - 68.7%, p-0.347). The authors explain it to fact that this group comprised of elderly patients, (>60 years) with associated high morbidities. Advanced radiotherapy techniques and gadgets in recent years have achieved conformal radiotherapy planning, respecting organs at risk without compromising dose to the tumor volume. A comparison of the Intensity Modulated Radiotherapy (IMRT) and the 3D conformal radiotherapy (3DCRT), by Minn and colleagues, failed to document any added advantage for IMRT over 3DCRT, and also showed that doses delivered using 3DCRT did not exceed tolerance levels of organs at risk. Critics of the preoperative chemotherapy protocol have always questioned the validity of pathological staging after neoadjuvant treatment. However, the biological response of the tumor is better understood with a neoadjuvant protocol, as reasoned by those who favor this. The results of ongoing trials such as the ARTIST II, TOPGEAR (Trial of Preoperative Therapy for Gastric and Esophago-gastric Junction Adenocarcinoma) the Irish ICORG 10–14 or Neo-AEGIS (NEO-adjuvant trial in Adenocarcinoma of the oEsophagus and oesophagoGastric junction International Study), and MAGIC-B might throw a better light on these issues. Neoadjuvant or adjuvant treatments cannot be a substitute for meticulous surgery in nonmetastatic adenocarcinoma of the stomach. However, where a R0 resection remains a low probability after evaluation and staging, a neoadjuvant treatment is to be entertained. Recent trends suggest the adoption of evidence-based strategies by the treating team, with age and tumor stage being the predictors of adjuvant options, whereas tumor location deciding neoadjuvant options. There still seems to be unexplored areas in the treatment of resectable adenocarcinoma of the stomach. The distinct difference between the trial designs in the Western and Asian countries wherein the Western investigators are trying to consolidate the results of preoperative treatment options, whereas the Asian groups are in the process of defining the postoperative strategies, stresses the query as to what decides the treatment paradigm. Is it the clinical and radiological observations or the pathological stage? How good is the biological response observed after neoadjuvant treatment as a predictor of further options, in the absence of initial pathological status? Does the suggestion that age, tumor stage, and tumor location as the predictors of adjuvant versus neoadjuvant options hold good despite being evidence-based? Surgery being the mainstay of treatment, there is consensus on achieving an R0 resection, and as emphatically suggested by Lordic and colleagues, neither neoadjuvant nor adjuvant options are a substitute for the same. Biological response modifiers have also been looked at in the treatment of adenocarcinoma of the stomach. Phase I and II studies on different molecules are ongoing. A survival benefit has been shown with the use of trastuzumab in gastric carcinoma. However, this response was observed only in patients with HER-2 positive advanced gastric tumors, a small subset of patients. The Trastuzumab for Gastric Cancer trial (ToGa trial) randomized advanced gastric and gastro esophageal cancer patients with HER-2 expression over, to chemotherapy (capecitabine plus cisplatin or 5-FU plus cisplatin at three weekly intervals) and chemotherapy with intravenous trastuzumab. The median survival was 13.8 months in the chemotherapy with trastuzumab arm and 11.1 months in the chemotherapy arm. The Avastin in Gastric Cancer trial (AVAGAST) looked at the benefit of the addition of bevacizumab in combination with 5-FU and cisplatin as a first line in advanced gastric cancer. The median OS was 12.1 months for the bevacizumab arm and 10.1 months for placebo arm. The subset analysis showed an advantage for non-Asian patients and patients with low vascular endothelial growth factor-A (VEGF-A) expression. Authors suggested that biomarkers such as plasma VEGF-A and neuropilin-1 predicted better response to bevacizumab. Although these have been tried in locally advanced gastric cancers, probably in a limited subset of patients with resectable tumors, biological modifiers may be helpful as a first line treatment, as was seen in the other sites where they have been tried, like in breast tumors. Data from the Indian subcontinent is mostly limited to case reports, case series, and a few case-control and epidemiological studies., It needs to be emphasized that a good proportion of gastric cancer patients in the country present with advanced disease, most often unresectable, or metastatic disease, with the result that treatment invariably has a palliative intent, which is further hampered because of poor performance status in a significant majority. On the surgical front, a study including 159 resectable gastric cancer patients treated with radical gastrectomy and D2 lymphadenectomy showed results comparable to Japanese observations. Sharma and colleagues from All India Institute of Medical Sciences (AIIMS), New Delhi, have documented a median OS and PFS of 10 and 8 months in a phase II study using Cisplatin, Etoposide, Paclitaxel regime with low dose platinum, in 33 patients with locally advanced or metastatic disease. Another pilot study from the same center on neoadjuvant chemotherapy using platinum and fluorouracil in 10 patients with locally advanced disease showed that curative surgery was feasible in 6 patients and had a median OS of 10 months. Regrettably, Indian data on chemoradiation or radiation in gastric cancer is not available, and the practice is entirely according to the results from abroad. Despite the different trials, consensus is yet to be defined in the adjuvant treatment of adenocarcinoma of the stomach. Huge disparities exist between the behavior of gastric cancers in the Asian, European, and the American communities. Laurens intestinal type of tumors is common in Asian population, and tumors tend to be located more distally among them. This is in contrast to the diffuse, more proximally placed tumors observed in the West. Most of the existing guidelines were formed from the results of the same trials, yet was modified to suit the patterns of care available locally and the disease profile. Biology of the tumor, regional treatment protocols, availability of skilled and dedicated centers, and facilities for cancer screening facilitating early detection can all influence the treatment outcomes. The screening of gastric cancers is intense in the Asian countries where gastric cancers have an endemic prevalence. This helps in identifying patients with early-stage disease, who are treated aggressively. The widely varied dietary patterns in the Asian continent and the Western regions also play an important role in the tumor progression and probably in the response to treatment. Hence, at present, it is difficult to reach a definite consensus regarding the ideal adjuvant treatment with the available evidence, in view of the varying cohorts. A study that looks into tumor parameters such as stage, extent, feasibility of surgery, and tumor biology, along with other demographic factors such as ethnicity, dietary, and related factors may help in tailoring a definitive structured treatment in adenocarcinoma of stomach. Sasako M, Sakuramoto S, Katai H, Kinoshita T, Furukawa H, Yamaguchi T, et al. Five-year outcomes of a randomized phase III trial comparing adjuvant chemotherapy with S-1 versus surgery alone in stage II or III gastric cancer. J Clin Oncol 2011;29:4387-93. Jansen EP, Boot H, Dubbelman R, Verheij M, Cats A. Postoperative chemoradiotherapy in gastric cancer-a phase I-II study of radiotherapy with dose escalation of weekly cisplatin and daily capecitabine chemotherapy. Ann Oncol 2009;21:530-4. Hallissey MT, Dunn JA, Ward LC, Allum WH. The second British Stomach Cancer Group trial of adjuvant radiotherapy or chemotherapy in resectable gastric cancer: Five-year follow-up. Lancet 1994;343:1309-12. Hundahl SA, Phillips JL, Menck HR. The National Cancer Data Base Report on poor survival of U.S. gastric carcinoma patients treated with gastrectomy: Fifth Edition American Joint Committee on Cancer staging, proximal disease, and the 'different disease' hypothesis. Cancer 2000;88:921-32. Gunderson LL, Sosin H. Adenocarcinoma of the stomach: Areas of failure in a re-operation series (second or symptomatic look) clinicopathologic correlation and implications for adjuvant therapy. Int J Radiat Oncol Biol Phys 1982;8:1-11. Bauer K, Schroeder M, Porzsolt F, Henne-bruns D. Comparison of International Guidelines on the accompanying therapy for advanced gastric cancer: Reasons for the differences. J Gastric Cancer 2015;15:10-8. Sano T, Aiko T. New Japanese classifications and treatment guidelines for gastric cancer: Revision concepts and major revised points. Gastric Cancer 2011;14:97-100. Jee Y, Hwang S-H, Rao J, Park D, Kim H-H, Lee H-J, et al. Safety of extended endoscopic mucosal resection and endoscopic submucosal dissection following the Japanese Gastric Cancer Association treatment guidelines. Br J Surg 2009;96:1157-61. Sue-Ling HM. The case for D2 resections. Ann R Coll Surg Engl 2007;89:672-4. Prameela CG, Ravind R, Dinesh M. Significance of patterns of failure after treatment with curative intent in adenocarcinoma of stomach. Eur J Cancer 2015;51(Supplement 2):e10. Kim SH, Karpeh MS, Klimstra DS, Leung D, Brennan MF. Effect of microscopic resection line disease on gastric cancer survival. J Gastrointest Surg 1999;3:24-33. Matzinger O, Gerber E, Bernstein Z, Maingon P, Haustermans K, Bosset JF, et al. EORTC-ROG expert opinion: Radiotherapy volume and treatment guidelines for neoadjuvant radiation of adenocarcinomas of the gastroesophageal junction and the stomach. Radiother Oncol 2009;92:164-75. McCulloch P, Nita ME, Kazi H, Gama-Rodrigues JJ. Extended versus limited lymph nodes dissection technique for adenocarcinoma of the stomach. Cochrane Database Syst Rev 2012;1:CD001964. Cuschieri A, Weeden S, Fielding J, Bancewicz J, Craven J, Joypaul V, et al. Patient survival after D1 and D2 resections for gastric cancer: Long-term results of the MRC randomized surgical trial. Surgical Co-operative Group. Br J Cancer 1999;79:1522-30. Bonenkamp J, Songun I, Hermans J, Sasako M, Welvaart K, JT JP, et al. Randomised comparison of morbidity after D1 and D2 dissection for gastric cancer in 996 Dutch patients. Lancet 1995;345:745-8. Edwards P, Blackshaw GR, Lewis WG, Barry JD, Allison MC, Jones DRB. Prospective comparison of D1 vs modified D2 gastrectomy for carcinoma. Br J Cancer 2004;90:1888-92. Shinohara T, Satoh S, Kanaya S, Ishida Y, Taniguchi K, Isogaki J, et al. Laparoscopic versus open D2 gastrectomy for advanced gastric cancer: A retrospective cohort study. Surg Endosc 2013;27:286-94. Verheij M, Jansen EP, Cats A, Grieken NCT van, Aaronson NK, Boot H, et al. Amulticenter randomized phase III trial of neo-adjuvant chemotherapy followed by surgery and chemotherapy or by surgery and chemoradiotherapy in resectable gastric cancer:First results from the CRITICS study. J Clin Oncol 2016;34:suppl; abstr 4000. Foo M, Leong T. Adjuvant therapy for gastric cancer: Current and future directions. World J Gastroenterol 2014;20:13718-27. Glimelius B, Ekstrom K, Hoffman K, Graf W, Sjoden PO, Haglund U, et al. Randomized comparison between chemotherapy plus best supportive care with best supportive care in advanced gastric cancer. Ann Oncol 1997;8:163-8. Wagner AD, Grothe W, Haerting J, Kleber G, Grothey A, Fleig WE. Chemotherapy in advanced gastric cancer: A systematic review and meta-analysis based on aggregate data. J Clin Oncol 2006;24:2903-9. Cunningham D, Allum WH, Stenning SP, Thompson JN, Van de Velde CJH, Nicolson M, et al. Perioperative chemotherapy versus surgery alone for resectable gastroesophageal cancer. N Engl J Med 2006;355:11-20. Macdonald JS, Smalley SR, Benedetti J, Hundahl SA, Estes NC, Stemmermann GN, et al. Chemoradiotherapy after surgery compared with surgery alone for Adenocarcinoma of the stomach or Gastroesophagea junction. N Engl J Med 2001;345:725-30. Songun I, Keizer H, Hermans J, Klementschitsch P, de Vries JE, Wills JA, et al. Chemotherapy for operable gastric cancer: Results of the Dutch randomised FAMTX trial. Eur J Cancer 1999;35:558-62. Hartgrink H, Velde C van de, Putter H, Songun I, Tesselaar M, Kranenbarg E, et al. Neo-adjuvant chemotherapy for operable gastric cancer: Long term results of the Dutch randomised FAMTX trial. Eur J Surg Oncol 2004;30:643-9. Ohri N, Garg M, Aparo S, Kaubisch A, Tome W, Kennedy TJ, et al. Who benefits from Adjuvant radiotherapy for gastric cancer? : A meta-analysis. Int J Radiat Oncol Biol Phys 2013;86:1-15. Bang Y-J, Kim Y-W, Yang H-K, Chung HC, Park Y-K, Lee KH, et al. Adjuvant capecitabine and oxaliplatin for gastric cancer after D2 gastrectomy (CLASSIC): A phase 3 open-label, randomised controlled trial. Lancet 2012;379:315-21. Ychou M, Boige V, Pignon JP, Conroy T, Bouche O, Lebreton G, et al. Perioperative chemotherapy compared with surgery alone for resectable gastroesophageal adenocarcinoma: An FNCLCC and FFCD multicenter phase III trial. J Clin Oncol 2011;29:1715-21. Schuhmacher C, Reim D, Novotny A. Neoadjuvant treatment for gastric cancer. J Gastric Cancer 2013;13:73-8. 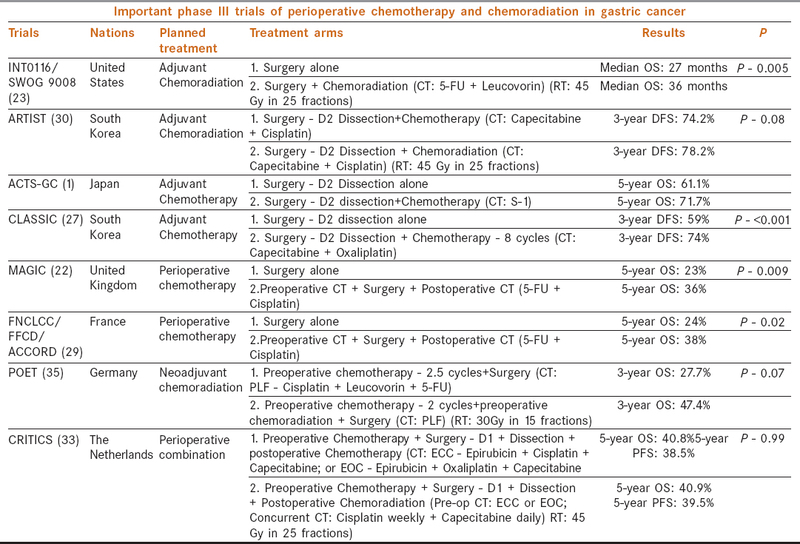 Choi AH, Kim J, Chao J. Perioperative chemotherapy for resectable gastric cancer: MAGIC and beyond. World J Gastroenterol 2015;21:7343-8. Yu JI, Lim DH, Ahn YC, Lee J, Kang WK, Park SH, et al. Effects of adjuvant radiotherapy on completely resected gastric cancer: A radiation oncologist's view of ARTIST randomized phase III trial. Radiother Oncol 2015;117:171-7. Zhou ML, Kang M, Li GC, Guo XM, Zhang Z. Postoperative chemoradiotherapy versus chemotherapy for R0 resected gastric cancer with D2 dissection: An up-to-date meta-analysis. World J Surg Oncol 2016;14:209. Dikken JL, Van Sandick JW, Swellengrebel M, Lind PA, Putter H, Jansen EP, et al. Neo-adjuvant chemotherapy followed by surgery and chemotherapy or by surgery and chemoradiotherapy for patients with resectable gastric cancer (CRITICS). BMC Cancer 2011;11:1-8. Cats A, Jansen EPM, van Grieken NCT, Sikorska K, Lind P, Nordsmark M, et al. Chemotherapy versus chemoradiotherapy after surgery and preoperative chemotherapy for resectable gastric cancer (CRITICS): An international, open-label, randomised phase 3 trial. Lancet Oncol 2018;19:616-28. Schuhmacher C, Gretschel S, Lordick F, Reichardt P, Hohenberger W, Eisenberger CF, et al. Neoadjuvant chemotherapy compared with surgery alone for locally advanced cancer of the stomach and cardia: European organisation for research and treatment of cancer randomized trial 40954. J Clin Oncol 2010;28:5210-8. Ashraf N, Hoffe S, Kim R. Locally advanced gastroesophageal junction tumor: A treatment dilemma. Oncologist 2015;20:134-42.
van Hagen P, Hulshof MCCM, van Lanschot JJB, Steyerberg EW, van Berge Henegouwen MI, Wijnhoven B, et al. Preoperative chemoradiotherapy for esophageal or junctional cancer. N Engl J Med 2012;366:2074-84. Lordick F, Siewert JR. Recent advances in multimodal treatment for gastric cancer: A review. Gastric Cancer 2005;8:78-85. Minn AY, Hsu A, La T, Kunz P, Fisher GA, Ford JM, et al. Comparison of intensity-modulated radiotherapy and 3-dimensional conformal radiotherapy as adjuvant therapy for gastric cancer. Cancer 2010;116:3643-52. Park SH, Lee SJ, Kim ST, Lee J, Park JO, Park YS, et al. Multicenter phase III trial of adjuvant chemoradiotherapy in stomach tumors 2 (ARTIST 2). J Clin Oncol 2015;33(Suppl 3):TPS228. Sherman KL, Merkow RP, Bilimoria KY, Wang CE, Mulcahy MF, Benson AB, et al. Treatment trends and predictors of adjuvant and neoadjuvant therapy for gastric adenocarcinoma in the United States. Ann Surg Oncol 2013;20:362-70. Meza-Junco J, Au H-J, Sawyer MB. Critical appraisal of trastuzumab in treatment of advanced stomach cancer. Cancer Manag Res 2011;3:57-64. Bang Y, Cutsem E Van, Feyereislova A, Chung H, Shen L, Sawaki A, et al. Trastuzumab in combination with chemotherapy versus chemotherapy alone for treatment of HER2-positive advanced gastric or gastro-oesophageal junction cancer (ToGA): A phase 3, open-label, randomised controlled trial. Lancet 2010;376:687-97. Ohtsu A, Shah MA, Van Cutsem E, Rha SY, Sawaki A, Park SR, et al. Bevacizumab in combination with chemotherapy as first-line therapy in advanced gastric cancer: A randomized, double-blind, placebo-controlled phase III study. J Clin Oncol 2011;29:3968-76. Van Cutsem E, de Haas S, Kang Y-K, Ohtsu A, Tebbutt NC, Ming Xu J, et al. Bevacizumab in combination with chemotherapy as first-line therapy in advanced gastric cancer: A biomarker evaluation from the AVAGAST randomized phase III trial. J Clin Oncol 2012;30:2119-27. Dikshit RP, Mathur G, Mhatre S, Yeole BB. Epidemiological review of gastric cancer in India. Indian J Med Paediatr Oncol 2011;32:3-11. Sharma A, Radhakrishnan V. Gastric cancer in India. Indian J Med Paediatr Oncol 2011;32:12-6. Shrikhande SV, Shukla PJ, Qureshi S, Siddachari R, Upasani V, Ramadwar M, et al. D2 lymphadenectomy for gastric cancer in Tata Memorial Hospital: Indian data can now be incorporated in future international trials. Dig Surg 2006;23:192-7. Sharma A, Raina V, Lokeshwar N, Deo S, Shukla N, Mohanti B. Phase II study of cisplatin, etoposide and paclitaxel in locally advanced or metastatic adenocarcinoma of gastric/gastroesophageal junction. Indian J Cancer 2006;43:16-9. Shukla NK, Deo S, Asthana S, Raina V, Dronamaraju S. Neoadjuvant chemotherapy in advanced gastric cancer--results of a pilot study. Trop Gastroenterol 2002;23:94-6. Ibrahim M, Gilbert K. Management of gastric cancer in Indian population. Transl Gastroenterol Hepatol 2017;2:64-64.